The first film to document how a city responds to the imminent tree crisis caused by invasive insects such as the emerald ash borer. It seemed to happen almost overnight. Thousands of trees started dying unexpectedly in SW Ohio. Cincinnati almost went broke cutting down trees and trying to keep the invasion from damaging property - or worse. The killer was a tiny insect known as the emerald ash borer, a new invasive insect from Asia that will wipe out every ash tree in America...unless we do something about it. 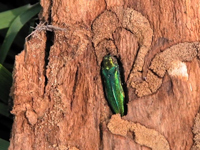 First found near Detroit in 2002, emerald ash borers have now infested trees in 35 states, from New Hampshire to South Carolina and as far west as Colorado. TREES IN TROUBLE: Saving America's Urban Forests tells the compelling story of how one community in SW Ohio confronted their tree crisis and fought the invasive pest by taking action and joining together. Through partnerships with scientists, city officials and everyday citizens, this community was able to fight the pest and protect their urban forests for future generations. The film also explores the rich history of urban forestry in the United States and the exciting new research linking human health and trees. Designed for audiences of all ages, TREES IN TROUBLE inspires viewers to take action, and points towards first steps. From the producer of the groundbreaking climate change film, RISING WATERS. "Highly Recommended...Clearly shows the value of the urban forest...Trees in Trouble is highly recommended as a clear explanation of the emerald ash borer infestation, the economic impact on the forests in infested states, and the difficulty and expense of eliminating infected trees and developing borer-resistant strains of ash trees." "What an arresting film! Beautifully made and engaging to watch. Trees are an important source of health for humans and nature and thus a vital part of our cities. This is a valuable resource for classroom and community showings across the country." "Plants make earth livable, and trees do that better than other plants. In a beautifully rendered story of Cincinnati's urban forests, Trees in Trouble reminds us that humans have the power to destroy trees or save them: the choice is ours." "Trees in Trouble clearly makes the case for the priceless value of city trees, the threats they face from exotic insects accidentally brought in to our cities, and the need for municipalities to take action. City officials, local tree committees, and interested citizens would all benefit from viewing this film." "Exotic species - those we have carelessly moved to places where they are not native - are a massive threat to global biodiversity. As this important film makes clear, nowhere is this more obvious than in our own cities and towns where insect pests are killing the trees that give us so much pleasure. So much is at stake if we are to keep our streets and gardens green." "Scholars, public health experts, and city residents are developing an increased awareness of the critical benefits that urban forests provide for people and nature. But these ecosystems and their benefits are under threat from invasive pests. Trees in Trouble brings much needed attention to this problem, highlighting, in stark terms, key policy and management challenges as well as the consequences for city residents and forests." "Trees in Trouble is an urgent call to action to protect our treasured urban street and park trees from extinction due to invasive insects and other threats - a must for teachers, parks managers, municipal officials, and people who love trees." "Informative and moving. Viewers will learn how at risk our forests are, and they may be compelled to take action to preserve them." "Trees create sense of place, and touch lives in special ways. The urban forests of American cities are threatened by pests that are stowaways with the goods that arrive from all the world. This film informs about invasive species management, preventive policies, and the community sense of loss if protection is overlooked."